The vision is spectacular, but does Rhode Island have the fortitude to make it a reality? The state's ambitious Land Use 2025 study predicts great things, but shifting away from decades-old development practices takes a certain amount of finesse, especially in New England where the fear of change can be paralyzing. A thinly settled, predominantly forested band in the western third of the state will conserve essential resources and support resource-based economies. These “Borderlands,” with adjoining conserved areas in eastern Connecticut, will continue to provide a distinctive break in the otherwise developed Boston to Washington, D.C., corridor. Conserved farmland and forests will surround town centers. The state’s centerpiece, Narragansett Bay, will be “healthy and productive.” This waterfront will remain the Ocean State’s trademark, carefully managed to provide utility and activity while also preserving the beauty of its natural features. In 2025, according to the study, Rhode Island will be a place that strikes the proper balance between the needs of its residents and the protection of its natural resources. That would be a welcome change over the type of development that indiscriminately gobbled up much of the state’s land. In the span of 34 years, from 1961 to 1995, Rhode Island went building crazy, developing more land for residential, commercial and industrial purposes than in the previous two-plus centuries. Construction of three interstate highways — I-95, I-195 and I-295 — was completed by the mid-1970s, but much of the increase in Rhode Island’s road mileage came in the form of newly paved residential neighborhood streets. Urban decay, largely enabled by a growing car culture, resulted in significant growth in many less-dense communities. Roads that originally were designed for light amounts of local traffic quickly exceeded their capacity. The term “road rage” would soon be introduced into the lexicon. By the 1980s, the amount of land in Rhode Island used for commercial purposes had increased dramatically, from about 7,000 acres to nearly 13,500. This fast-paced growth occurred mostly in the suburbs, and along the most heavily traveled roadways. In fact, from 1970 to 1995, development in Rhode Island exploded. During this 25-year building boom, the amount of developed land in the state increased 43 percent, from about 143,000 acres to 205,200, according to the state Division of Planning. Large-lot subdivisions, strip malls and shopping centers — think West Main Road in Middletown — easily accessed only by car had become the development rage. Soon, valuable land was developed at rates that far exceeded the pace of population growth. Farmland and open space were turned into gigantic parking lots, wetlands were filled in, forests were fragmented and water resources were degraded. All this building and the acres of pavement that accompanied it, generated millions of gallons more of stormwater runoff that soon would be polluting the Ocean State’s streams, rivers and beaches. Today, stormwater runoff is considered Rhode Island’s biggest environmental problem, as there is now no natural pathway for this polluted water to follow. Suburban development at the rural fringe and divorced from historical growth patterns eventually was labeled “sprawl.” Often defined as a “low-density, large-lot, scattered and inefficient development pattern that consumes an unnecessarily large amount of land and natural resources,” sprawl is widely recognized as the dominant trend in land use during the past half-century, in Rhode Island, throughout New England and across the United States. Twice in the past three-plus decades, the state has tried to get a better handle on development, but neither of those plans slowed the sprawl. In fact, since the last study was published 20 years ago, about 30 percent of the land then identified as undeveloped has been covered with asphalt, concrete and steel. Land-use plans created in 1975 and again in 1989 both failed to adequately deal with the fiscal aspects of land use, most notably property rights and taxation, according to the state’s most-recent land-use study. City and town planners and state officials now point to the 154-page Land Use 2025 study as the document that will sensibly guide Rhode Island development for the next two decades. While planners at the municipal, state and academic levels say the causes of sprawl are complex and multifaceted, they agree that “smart growth,” which promotes more sustainable practices and compact development, is a solution to the problem. Smart-growth practices outlined in the Land Use 2025 study include mixing land uses, creation of pedestrian-friendly neighborhoods and preserving open space, farmland and natural resources in critical environmental areas. Smart growth means being more environmentally friendly by protecting resources with higher-density developments, said Lorraine Joubert, a program director for the University of Rhode Island’s Cooperative Extension. The Land Use 2025 study aims to stop that practice. Smart-growth development, however, takes time, resources and patience, according to Jon Reiner, North Kingstown’s planning director. It also takes a fair amount of astute planning. “We need to determine where we want to promote growth in the future and where we want to discourage growth,” Reiner said. He used the South County Commons in South Kingstown and Chapel View in Cranston as examples of the type of mixed-use development the Land Use 2025 study encourages. The study promotes development in the highly populated and relatively narrow corridor that flanks the shores of Narragansett Bay and fills the valleys of the Blackstone and Pawtuxet rivers. This urban/suburban corridor, about 20 miles wide and 40 miles long, contains slightly more than 75 percent of the population and nearly all of the state’s public infrastructure, major transportation routes, and institutional and cultural centers. Development, though, helps municipalities, even the rural ones, pay the bills. To keep the rural areas of the state green, they need to be kept out of the red. This is where the state’s two previous land-use studies largely failed. It’s also why some communities outside of the aforementioned urban/suburban corridor haven’t embraced the recommendations of the Land Use 2025 study, because they might someday need revenue from future residential and/or commercial development. That possibility hasn’t gone unnoticed, even during the past few years when the economy has struggled and development has remained flat, Flynn said. But many state and local officials and environmentalists don’t want to squander the state’s declining green space, especially for low-density uses such as big-box stores surrounded by fields of asphalt or homes built willy-nilly on acre-plus plots. To help keep that from happening, the state’s greenest towns need financial help, such as the $1 million in grants the Statewide Planning Program recently awarded to 18 regional and local planning initiatives, and guidance. Developers shouldn’t shoulder all of the blame for unleashing 50 years of sprawl. The allure of additional tax dollars drove shortsighted municipal officials and taxed-to-the-max residents to look past the ills of haphazard growth. They just need municipal officials to give them streamlined permitting processes and incentives to build in more environmentally friendly ways, he said. 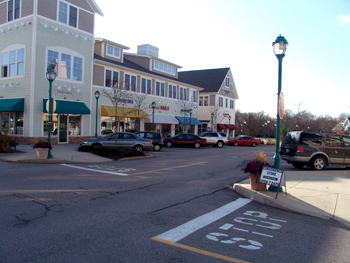 To that end, North Kingstown, in 2008, became the first municipality in the state to adopt a transfer-of-development-rights (TDR) program. TDRs essentially allow landowners to sever development rights from properties in government-designated low-density areas and sell them to developers who want to build in other sections of the community that local officials have deemed better suited for development. In North Kingstown’s case, that means directing development to Post Road (Route 1), which has the infrastructure to better handle growth. In East Providence, future development is being directed to 300 acres of waterfront property that was once home to Chevron, Arco, Amoco and other businesses that left behind vacant buildings and contaminated soil. Soil remediation has since been conducted, and East Providence’s planning director, Jeanne Boyle, is working to redevelop the city’s underused waterfront. The redevelopment of the waterfront district should be a self-sustaining mix of commercial, residential, institutional, light industrial, civic and recreational uses, she said. East Providence is working with a few developers on possible waterfront projects that would fit in with the state’s recommended development practices. “Protecting and enhancing the essence of what it means to live in Rhode Island should be our legacy to future generations,” Flynn said. The Rhode Island Constitution even calls for the preservation, regeneration and the restoration of the state’s natural environment. The authors of that document, however, likely didn’t anticipate the destruction caused by sprawl.